A novel live-cell imaging method, dubbed the Photonic Crystal Enhanced Microscope (PCEM), could someday help biologists better understand how stem cells transform into specialized cells and how diseases like cancer spread. The PCEM enables scientists to dynamically monitor and quantitatively measure the movement of cellular materials at the plasma membrane of individual live cells. 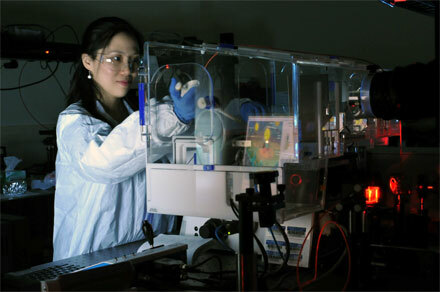 Yue Zhuo, post-doctoral researcher and Beckman Institute Fellow, can image live cells without fluorescent dyes using the photonic crystal enhanced microscope. Courtesy of G. Pluta. The microscope uses a photonic crystal biosensor surface, which can be coated with extracellular matrix materials to facilitate cellular interactions, within a modified brightfield microscope with a low intensity non-coherent light source. Developed by researchers at University of Illinois at Urbana-Champaign, it can perform label-free live-cell imaging with high sensitivity and high lateral and axial spatial resolution, thereby allowing dynamic adhesion phenotyping of single cells without the use of fluorescent tags or stains. 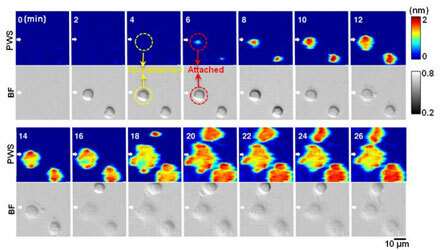 "Our approach is important because there are not currently label-free and high-resolution imaging tools that allow cell-surface interactions to be quantified and imaged dynamically, although these processes are fundamental to things like wound healing, tissue development, tumor invasion, and cancer metastasis," said professor Brian Cunningham. "The advantage of our PCEM system is you can see as the [live] cell is beginning to attach to our sensor, and we can quantitatively and dynamically measure what happened at that time," said researcher Yue Zhuo. "We're able to actually measure a very thin layer on the bottom of the cell that's about 100 nanometers, which is beyond the diffraction limit for visible light." Label-free and dynamic detection of stem cell adhesion uses the photonic crystal-enhanced microscope. Courtesy of Yue Zhuo, University of Illinois. Most conventional imaging methods rely on fluorescent dyes, which provide just a short window of time for cell examination and measurement. According to Zhuo, fluorescent tagging doesn't allow scientists to see how a protein or cell changes over time. "You can see the cell for maybe a few hours maximum before the fluorescent light dies out, but it takes several days to conduct a stem cell experiment," said Zhuo. "Scientists commonly use fluorescent tagging because there's no better way to monitor live cells due to their low imaging contrast among cellular organelles. 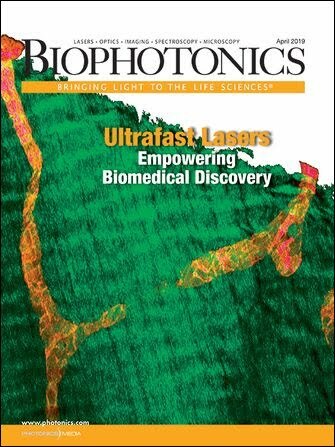 That urges us to develop a label-free and high-resolution imaging method for live cell study." The researchers used the PCEM to investigate adhesion and the early stage migration of different types of stem cells and cancer cells. By applying image processing algorithms to analyze the spatiotemporal information generated by the microscope, the team gained insight into how the plasma membrane of anchorage dependent cells is dynamically organized during cell adhesion. The team believes that the PCEM provides a novel means of gaining a deeper understanding of the mechanisms involved in cell adhesion and concurrent or subsequent migration events. The PCEM employs an LED light source and a biosensor made from inexpensive materials such as titanium dioxide and plastic, and uses a fabrication method similar to nanoreplica molding. “Our sensor can be massively fabricated easily, and our cost to make the sensor is less than $1 each,” said Zhuo. In the future, Zhuo plans to outfit the microscope with higher imaging resolution and someday hopes to be able to build a library of cell adhesion data for scientists. "Different types of cells will have different dynamic attachment profiles." she said. "We can use this library to screen different types of cells for tissue regeneration, disease diagnostic, or drug treatment, for example, see how diseased cells spread, or see how the cancer cells respond to different drug treatment." The research was published in Progress in Quantum Electronics (doi: 10.1016/j.pquantelec.2016.10.001).